The Super Bowl means super deals on televisions, with the best sales since Black Friday at electronics stores. We found David Rogers shopping the TV sale at Best Buy. "The $3,000 or $4,000 ones have such views, it's just amazing," he said, though they were beyond his modest budget. The good news is that whether your budget is $4,000 or $400, you'll find great deals right now, including on top of the line OLED and QLED sets. 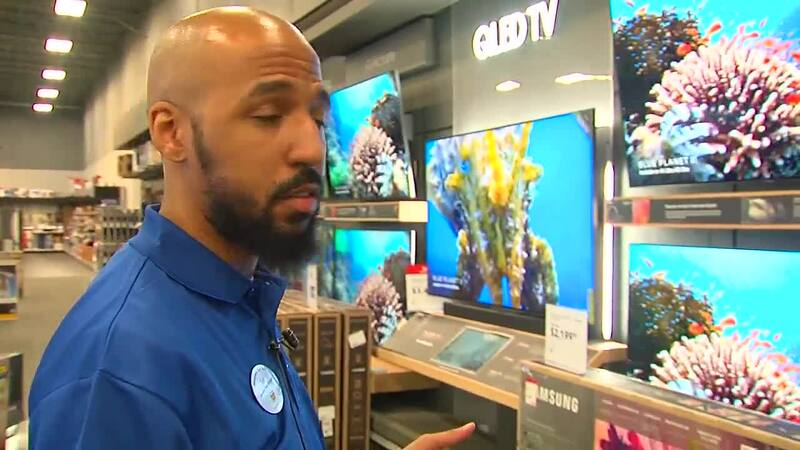 Best Buy manager Rim Richardson said it's like Black Friday without the crowds. "For those folks who hang out waiting for the Black Friday season," he said, "this is a good time to get a TV, especially for the big game." You know how they say when it comes to age, 40 is the new 30? When it comes to TVs, 75-inch is the new 65-inch, with many 75-inch sets now coming down to their lowest price ever, even cheaper than last Black Friday. Richardson says the big three brands — Samsung, Sony, and LG — all have 75-inch 4K TVs for under $1,500 for the first time. "If 75-inch is too big," he said, "65 is still a great option to go as well." And those prices are now below $900 in many cases. If you are on a budget, Best Buy has a 60-inch LG marked down to $649 for the Super Bowl. And if you are truly on a budget, they are selling a 65-inch TCL/Roku TV, at a Black Friday-like $499. No Best Buy near you? Other stores have great sales as well. Target is taking $300 off many LG TVs. Walmart has a big sale on Vizio sets, such as a 65-inch Vizio for $698, among other deals. But if you want the best Super Bowl party on your street, Richardson says consider the newest size. "For someone who wants to be the talk of the neighborhood, we have an 85-inch Sony," he said. It's not cheap at more than $3,000, but it will give you a temporary edge in the big screen TV arms race. As always, don't waste your money.